KC is on a mission to bring people together in Africa through board games. He has been making games since 2013 and enjoys sharing this joy with others. Name – Kenechukwu Ogbuagu. Kenechukwu means ‘Thank God’. My friends call me KC. 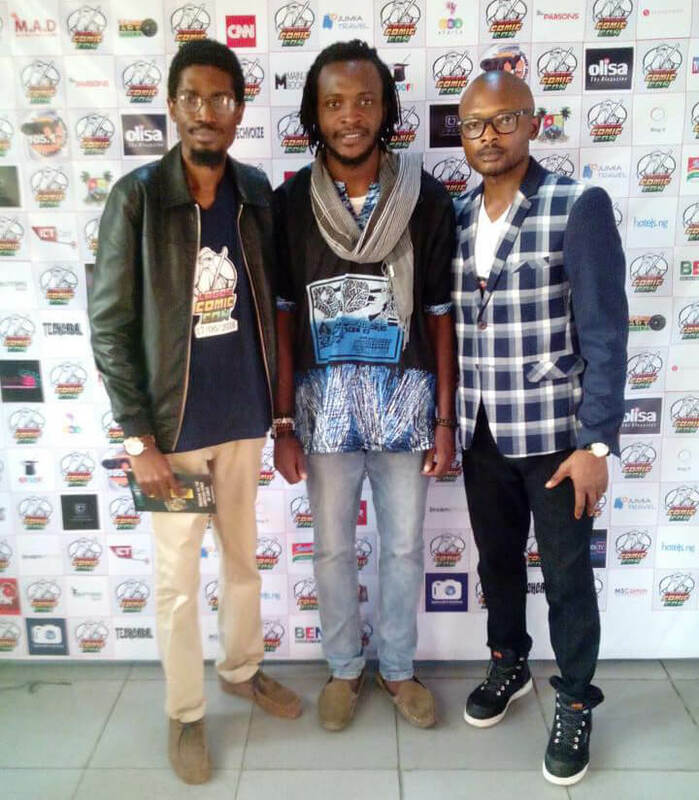 Location – I live in Abuja. The capital of Nigeria. 1. When did you start playing board games? Erhmmm, I guess from childhood. 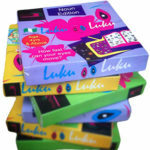 I remember playing Snakes and Ladders, Ludo and Drought at the age of 6. But I think I probably started playing at even a younger age. 2. Why did you start playing board games? I guess at that age, if it wasn’t fun, I might not have played them again and again. 3. When did you start making board games? I designed my first game in 2013. It was just a casual thing; I didn’t know designing games was even something to do. 4. Why did you start making board games? My first game was designed to keep my friend from being bored. That was the sole reason. And it’s funny looking at the reasons I went on to design more games. From him, I learned that games bring people together in an exciting way and then engages them enthusiastically. That is what I want to keep doing. 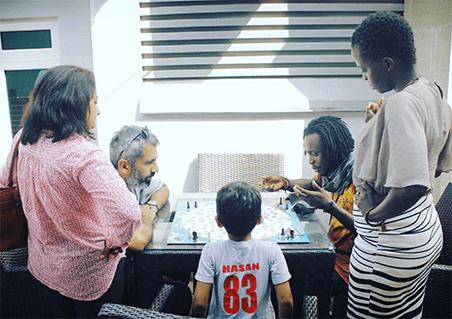 KC has created a team of individuals to help him bring people together through board games. 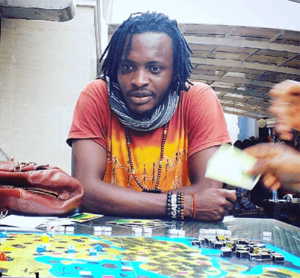 He has made many prototypes (games) himself and even organized Africa’s first board game convention, ABCon 2016. 1. What is the first board game you made? It’s called “Ukubuwa”. It’s my first baby. The name is actually a Swahili word for ‘Greatness’. “Ukubuwa” attempts to bring choice and chance to play and the narratives comes from the story of an average young Nigerian. It took me more than a year after my first sketch to actually design it and involve other people to play it. 2. How do you make the art for your game? It’s so difficult and I have been looking for an illustrator to be part of our team. Most times, am limited by the art in my designs and tend to do with what I have. I have a basic knowledge of designing myself and sometimes, I seek artworks from open source sites and forums. 3. What software on the computer do you use? I use Coral Drawx6 most times and on few occasions, Adobe CC (mostly Illustrator). 4. What is your favorite game (prototype) you have made? That’s a very difficult one. I just love the games. 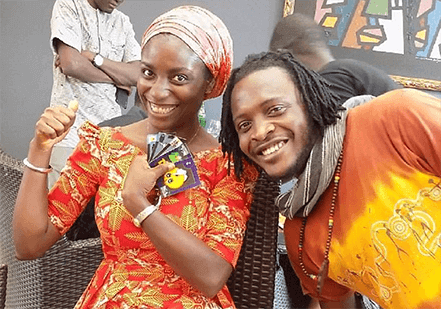 There is “Oya”, a game about the street life in Nigeria. There is “Safe Journi” that takes you through the happenings during a road trip in Nigeria. I have “Bound in Freedom” with narratives on fighting terrorism and it’s a collaborative game (see other Co-op games here). 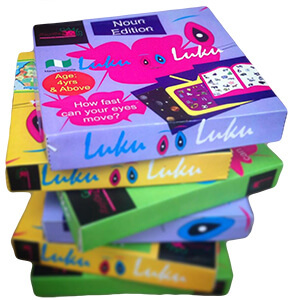 I have “Farm Whatever” – an agricultural based game and “Luku Luku” which is the first and only published game from us and its really engaging. We have a few more games too. Each of them is thrilling and feeds specific targets. 5. Where did you get your prototypes printed? I print everything in Nigeria. That feeds into our objective of sharing our heritage with the world through using materials and cultural techniques in our products. 6. Is it expensive for you to make prototypes living in an area where board gaming is not popular? I have learnt that when the dream is big enough, the odds will no longer matter. We do encounter challenges with the prices especially since most people are totally new to it. However, we continue to make good negotiations as we increase the interest of gaming among people. 7. 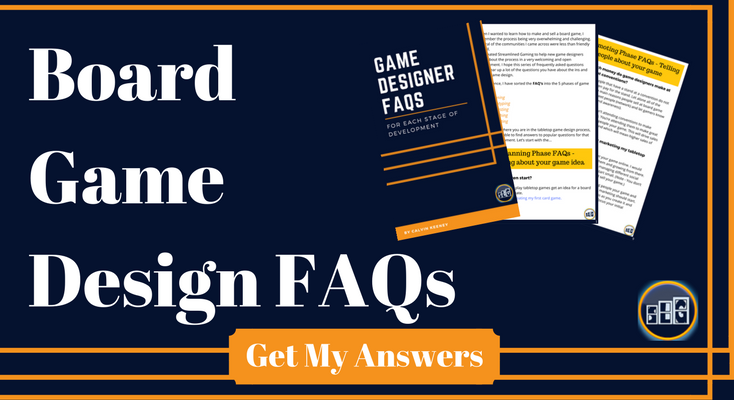 Is it hard to find playtesters for your games? Actually, no. We only have challenges with finding the right environment to playtest. Maybe a game table, a quiet space, you know what I mean. We are currently starting a board gaming group where we would be meeting weekly to play board games and also looking to have our own space too – a world of table-top activities. 8. What is your favorite part of making games? Geez! I just love the thinking part where you are constantly replaying a game in your head and changing the mechanics and thinking of the components that will best suit the game and at the same time thinking if you can make these components as well as if you have a budget that would cover the production. I just love the part of designing the game rules and patterns. It’s a magical moment. 9. What are the biggest problems you have making games? My biggest challenge is finding human resources. Am currently in search of a team of young people; with different skills to add value to what we want to achieve with the Table-top gaming industry in Nigeria. We have foreseen getting our market to trust that board games are worth trying to achieve fun and be able to learn and pass on knowledge and so are working constantly in doing that. First I would want to thank my co-organizer – Zainab Haruna; she was instrumental to the success of the convention. 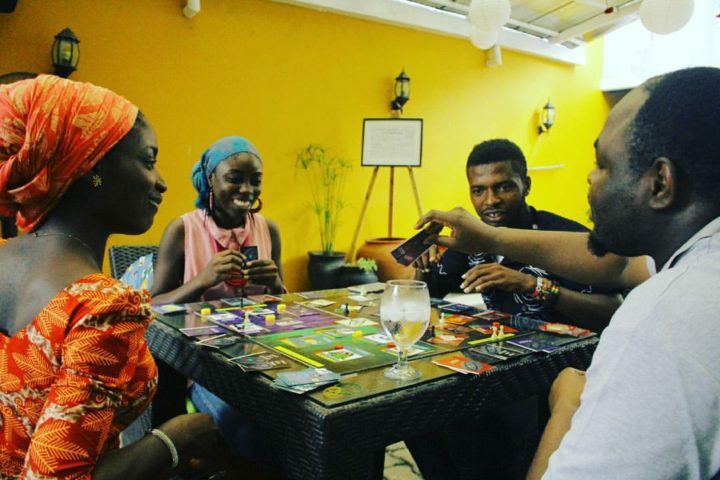 It was the first ever board game convention in Nigeria. ABCon2016 was thrilling and everyone who came was surprised to play board games other than the 6 games that only exist in my country. We had comments like, “you made me remember my childhood”, “thank you for exposing me to such boardgames” and lots more. It was encouraging too to see gamers who are not Nigerian participate in the convention and were really excited to play games with Nigerian narratives. We intend to make ABCon2017 even more interesting and fun. “I want to use this opportunity to thank the boardgame community worldwide. I have directly been engaging with some people and I know others are watching and I am motivated and inspired on a daily base to continue including learning new things every day. I just want to make create so many games. I literally talk to myself because I constantly play games I am yet to create in my head. And thank you too KC! I had fun getting to know you and hearing your story. It is very inspiring to see you influencing so many people in a positive way through board games. That is very similar to our mission here at SLG as well. To bring people together by encouraging and teaching them how to make games. I hope we can help learn from each other going forward as to how we can accomplish this mission on 2 separate continents. If you missed last week’s interview with Chris Amburn, then don’t forget to check it out as well. And feel free to follow KC’s progress on his Facebook page and on his blog. What an interesting story! He sounds amazing and so creative. I really enjoyed to story.